Versatile enough for just about any occasion but this kit is perfect for summer parties, picnics and retro rockabilly themed parties too! And the best part ... print and make as many as you like for your own personal use! My kits are easy to assemble and come with full written instructions. For this kit I have created a how-to video with assembly tips. Please note that NO physical items will be shipped. ALL ITEMS ARE DIGITAL FILES. 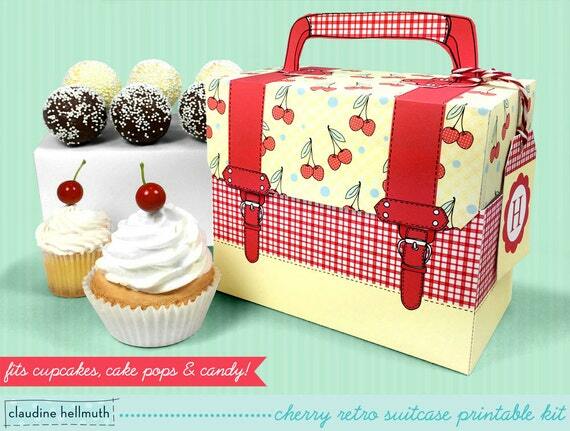 ★ 10 page high resolution PDF file with templates to create your cherry retro styled suitcase, customizable monogram luggage tag, standard size cupcake tray, mini cupcake tray and cake pop stand! Print and make as many as you like for your personal use! All files are formatted to 8.5" x 11" letterhead sized sheets to be printed in landscape orientation. Actual document size is 8"x10" so that the file will also print on A4 paper. Depending on your printer and monitor, colors may vary slightly from photos. ★ Adobe Acrobat Reader software (available FREE from get.adobe.com/reader/) to open and print the files correctly. Please email me or etsy convo me with any questions! Please use these files to fill your home, celebrations and events with joy and whimsy! Print and make as many as you would like for your own personal use. Make a few for yourself! And don't forget to make some to give as gifts to your friends and family! Thank you for supporting the hours of work that go into creating these designs by not forwarding or sharing any of the files with others. If you know someone who is interested in my kits, please send them to my store so they can grab one of their own! All of my designs & illustrations are registered, copyrighted and protected under United States and International copyright law. This means that they can not be manufactured, distributed, altered, edited, copied, sold, shared or used for profit commercially in any way without my written permission. Delight your customers with original boxes for your sweet treats! Imagine an original bespoke cupcake or candy box that looks like a mini version of your bakery, cupcake shop or food truck! I can create a completely custom design for you or modify one of my existing designs. Just send me an Etsy convo or email! If you are a shop or small business, please contact me for a commercial license to use my printable kits as packaging for your consumer goodies. Send me an Etsy convo or email and I'll get you set up with a reserved listing. Artwork, designs and illustrations are © Claudine Hellmuth. All rights reserved.